I got a very big hamper from a supplier this year..consisting of 1 carton of Tiger Beer, 1 carton of Red Wine and 2 cartons of F&N Orange drinks..On normal days, I won't bother with buying beer to cook. 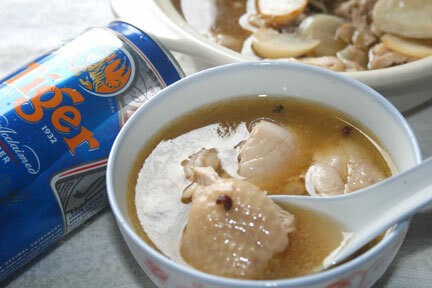 Since I have so much to spare, I use 1 can to cook this..as a tonic soup for Benny. Very easy to do...Deliciously good especially on cold night. Best to consume this hot..! I also used my home made pickled Garlic to cook this..heavenly..
2. Cut up chicken into thick chunks. 5. Add chicken and stir fry over high heat for 3 mins. 6. Add beer, szechuan peppercorns, salt to cook till it boils. 7. Cover the wok and simmer over medium heat for 10 minutes. 8. Turn off fire, dish out and serve warm. yes..! coz its cooked. The liquor has somehow subsided. All my nieces, nephews drunk this during 1st day CNY at my mom's place. My youngest nephew is K2. But he doesn't like..
the rest of my nieces/nephews are around P2 to P5. No need to worry, Dream. Alcohol will definitely evaporate when exposed to high heat.